It was almost like an innocent joke made by an old friend that cannot get you upset even if it's not quite perfect moment for a joke and you're not in the mood for it. Walking on the alley along the park I felt a delicate pale of wind, like a faded music, then I've noticed another copper leaf falling from a tree right next to me, and another one... creating slowly a colorful autumn leaves natural carpet. I stopped for a while, looked around and only now I realized that the whole surrounding scene had changed its color from greenish to pale green and yellow green, soon turning out reddish almost without noticing. I do enjoy summer but somehow cannot wait to feel, hear, smell and see the nature amazing metamorphosis throughout the seasons, and especially the wonderful autumnal scenery, rustling leaves and landscape under the spectacular reddish rusted autumn leaves colors. Albert Camus quote about Autumn - "Autumn is a second spring where every leaf is a flower." John Muir quote about Autumn leaves - "Climb the mountains and get their good tidings. Nature's peace will flow into you as sunshine flows into trees. The winds will blow their own freshness into you, and the storms their energy, while cares will drop off like autumn leaves." I’m sure that next week, if your sight would not be still captured at every step made by summer temptations, perhaps you could notice these “pioneer” falling leaves. October is the most beautiful scenery here, when you can witness a reach palette of autumn trees and the autumnal leaves colors all over the place. Autumn is the perfect season to be a bit introspective and allow yourself to dream at past, present and future, enjoy all sweet-bitter moments, and be delighted with whom we are, while sipping a tasty cup of coffee or tea in front of our porch or at a taverna, watching further the falling leaves show, at sunrise, sunset, or any other moment of the day. Enjoy the colorful autumn leaves, or simply the touch of a copper leaf, and reborn within your own self! By their increase, now knows not which is which." 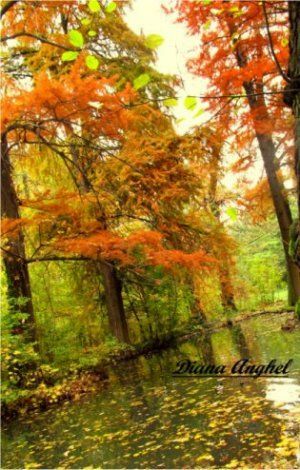 Emily Bronte quote about Autumn - "Every leaf speaks bliss to me, fluttering from the autumn tree." Falling leaves in Autumn are a perfect moment for romance – autumnal romance! Autumn leaves are one of the most inspiring thing for art in general – color and non color – they were “muse” for so many poets, musicians, art photography. 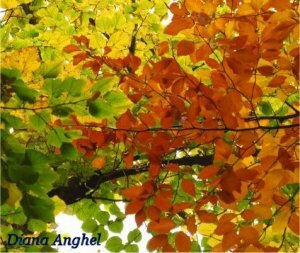 These beautiful autumn leaves generated romantic poems, sensitive quotes, wonderful movies, music and awesome photos (for example the magnificent O’Keefee autumn leaves). I live in a neighborhood with large numbers of huge old trees of many varieties. I particularly enjoy the autumnal season when those leaves change color at different times for each tree variety such that each week a different hue arrives in the landscape. The sounds of the leaves in the frequent autumnal winds is striking and unique for the season. There are rolling hills here and many groves of trees in addition to the tree-lined streets, left over from decades ago when the area was dense forest before residential development encroached. The winds travel over the hills and mounds, creating an almost a sound almost like an ocean surf, a sound that is a mixture of rustling leaves that in some cases are brown and brittle and in others are still red and yellow and yielding. Although the city has grown over the years, we still have pockets of the original forest left in which one can find deer and wild turkey and other wildlife which sometimes can be viewed in early morning while driving down the streets and lanes. Those fortunate to live on the edge of these areas sometimes wake to find deer grazing in their backyards, all of these just 10 minutes from the central downtown area of the city. Even beavers have recently moved back into the area, taking up residence in the many streams that meander through the strips of undeveloped countryside. This time of year, the Canadian geese are flocking and while some pass over and move further south, many stay year-round at one of the many lakes and ponds that still dot the area. The land, the wildlife, the trees, all still maintain their hold. 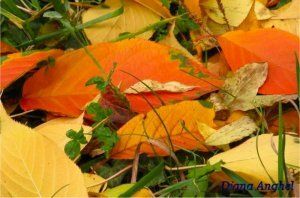 As the leaves fall up and down the streets while the cold wet autumn winds blow, one homeowner after another can be seen attempting to manicure their yards, to clear away the leaves, to wipe clean the change of the seasons. They succeed for a day… and then the winds come and the leaves fall and the carpets of grass are covered again awaiting the winter snows. They will try again and succeed for another day, only to lose to the unflappable persistence of nature just hours later. It is a reminder that though we continue to change the land, the land itself remains and is changed by nature in ways we cannot control. Autumn is the perfect season for traveling – cooler days, friendly weather, breathtaking landscapes, a colorful rusted leaves carpet covering everything, a large variety of delicious seasonal fruits, new wine, flavored desserts (like pumpkin pie), and lots of other appetizing food for all tastes. or any other spot you dreamed about. Charles Dickens quote about Autumn - "On the motionless branches of some trees, autumn berries hung like clusters of coral beads, as in those fabled orchards where the fruits were jewels . . ."